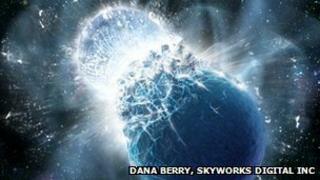 New evidence has been uncovered of a rare cosmic event that is proposed as a source of heavy elements such as gold. Observations from the Hubble Space Telescope appear to show a distant collision between two neutron stars - the remnants of massive supernovae. Astronomers suggest that such collisions are responsible for ultra-short bursts of gamma rays occasionally seen across the Universe. The work is described in a paper on the pre-print server Arxiv.org. Although rare, neutron star collisions would generate the enormous fluxes of neutrons needed to make elements heavier than iron, like platinum, lead and gold, by rapid neutron capture. Prof Edo Berger and colleagues from Harvard University analysed Hubble observations of a short burst of gamma rays, lasting only one fifth of a second, seen from a galaxy 3.9 billion light years away. The infrared afterglow of this burst of gamma-ray light appears to show the characteristics expected during radioactive decay of atomic nuclei generated in a neutron star collision. This sort of event emits light with an intensity that lies between normal star light and that of a supernova, and the term "kilonova" has been coined to describe it. They appear to be around 1,000 times rarer than supernova explosions, and occur when the remnants of two supernovae collide. If confirmed, the result represents the first observation of a neutron star collision, and provides an explanation for the rapid "R-process" of atom-building that must generate the heavy elements on the periodic table, such as gold and platinum. Neutron stars are incredibly dense and massive. As well as bursts of light, when they collide they are also expected to send gravity "shock waves" through the Universe. Experiments in America and Europe are now focussed on measuring such waves, and combined with the type of events seen by Hubble in the last month this will provide a further confirmation of neutron star collision. Astronomers are now testing the conclusions of the Harvard group with further detailed analysis of the Hubble data.